Give your artwork or photography a fresh and modern look with richly coloured and long-lasting medium canvas prints. A contemporary print is perfect for displaying family photos or for brightening up your home, and they’re all handmade onsite in the UK. Create stylish reproductions of your photos as medium canvas prints. A modern alternative to traditional framing, your photographs are printed to the highest quality on sustainably sourced materials. Using a superior printing method, a beautifully coloured print is produced with sharp details and an even tone, adorned on genuine heavy canvas. Your design is hand-stretched over wooden frames which are FSC certified. Each frame is handmade to order in the UK and is laminated to prevent cracking or splitting over time. 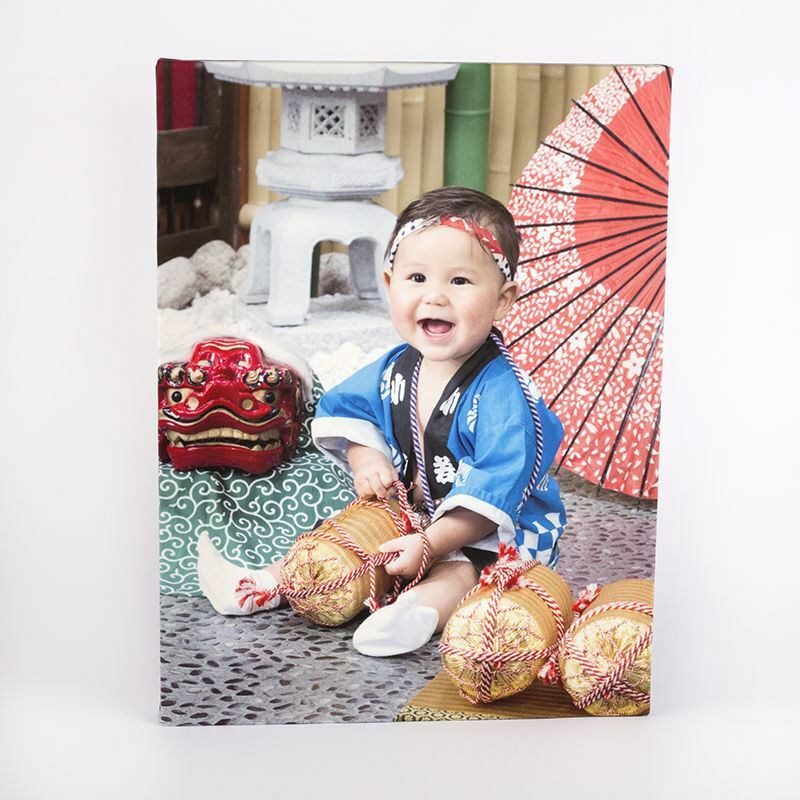 Every medium canvas is made to last, so we offer a lifetime guarantee with every print. Standard canvas sizes are available alongside a range of other size and depth options, so you can create a print which is perfect for you. Start designing your medium canvas using our online studio, where you have full creative control over your print. There’s also the option to customise your design by adding extra images, text, or creating a montage. With a range of flexible sizes and a fast turnaround time, there’s no limit to where your imagination can take you. Standard canvas sizes are perfect as gifts or as home décor and are available in depths of 2.5 cm and 4.5 cm. Choose from a range of sizes from small (30 cm x 30 cm) to large (200 cm x 150 cm). For medium canvas prints over 150 cm, a depth of 4.5 cm will be needed for added support. Your designs will be presented on a genuine 300 gsm woven canvas. A high quality 100% poly material is used as opposed to cotton, as this remains strong and won’t weaken over time. The fabric is finished with a gentle grain to enhance your images. Our hand built frames are crafted onsite by our skilled makers, to ensure that everyone receives the best care. The frames are created from high-quality FSC certified pinewood and are laminated to prevent any cracking or splitting in the future. The premium wood in standard canvas sizes is also warp-proof and gives your design a sleek and contemporary finish. Each canvas comes with 8 wedges opposed to the traditional 4, to get that perfectly tensioned canvas. A sublimation dyeing process uses heat and pressure to press the inks directly into the canvas fabric. This means that your print will be durable and scratch-proof, and can even be washed if necessary. This printing method produces prints with beautifully rich colours and no shiny plastic coating on top. The texture of the canvas grain compliments the sleek matte finish of the print. To preserve the colours of your design, keep the canvas out of direct sunlight. Alongside our sustainably sourced wood, we use environmentally friendly inks to reduce our carbon footprint. Our products and processes are eco-friendly wherever possible, for peace of mind. We provide a range of wrap options for standard canvas sizes. You have the choice of a mirror wrap where your image is reflected over the canvas edges or a gallery wrap where the image extends over the edges. Alternatively, opt for a coloured wrap which gives your design sleek coloured edges. For this option, press “Start Design” and then place your image in the template and select the coloured option. Important details can sometimes get lost along the edges, so check our design tips below for guidance on choosing your wrap. Your medium canvas comes stretched and ready to hang, with a simple to use free wall hanging kit. Affix the picture hook to the back of the frame, and use the included wall plugs and screws to hang wherever you choose. If important details of your design are near the edge of the photograph, they may get wrapped around the edges of the canvas if you choose a gallery or mirror wrap. Examine your photo and choose the best wrap option to give you a high-quality print. Particularly for images of people, make sure the heads aren’t too close to the edge. Please note that with designs with a large area left white, the frame can sometimes be visible through the canvas fabric. The bleed is the area around the main focal point of the image to allow for leeway during printing. It is likely that the bleed will be cut off from the final print so don’t include any important details in this area, but make sure to fill it in case it appears on the final design. Prints in medium canvas sizes are a beautiful and modern way to display art in a variety of settings. Try displaying an image of one of your paintings or photography for an exhibition; the canvas will give the piece a contemporary feel, and remain sleek and stylish. Try hanging a monochrome medium canvas on a large coloured wall to create an impact in your living room. Medium canvases are also a great way to add some edgy design to your office; choose a selection of cityscape images, or abstract coloured designs for a splash of vibrancy on your prints in medium canvas sizes. Our online design studio offers multiple montage options so you can create an imaginative and exciting design. Choose differently shaped collage templates and our design interface will automatically arrange them for you. Add multiple photos by uploading directly from social media or your computer.